My friend gave me this deck Monday and every time I use it, it’s so freakin’ accurate. It’s called the Book of Shadows Tarot Vol 2 and it features modern witches using subtle magick in our world. In this reading, the first card shows a man writing on a computer and the 2nd card shows a woman waiting for a letter. You can see the postman delivering it through the window. It’s hilarious because I’m waiting for my friend, Dario, to send me a short story he’s writing for a fiction exchange we’re doing. 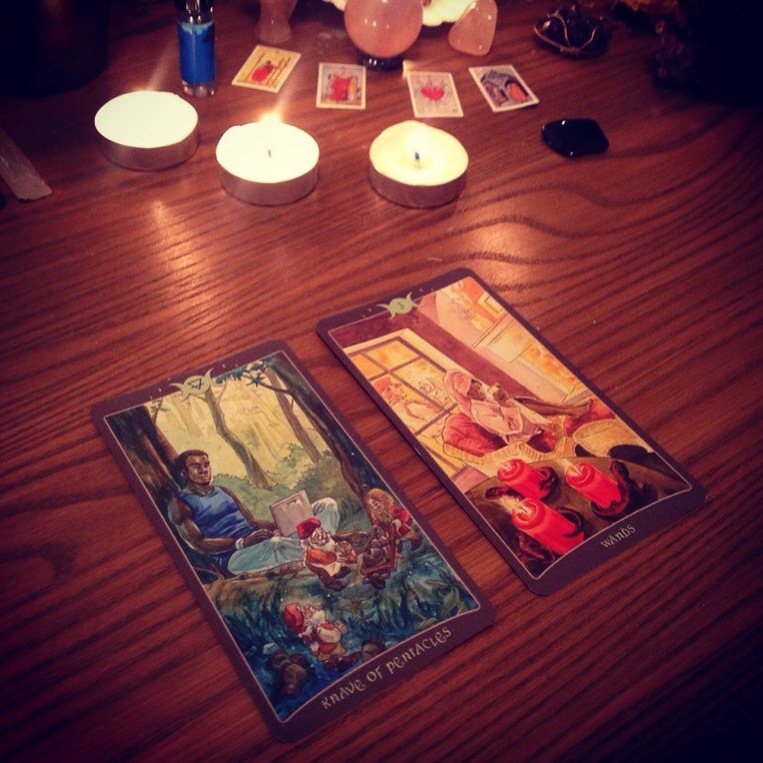 In all, this deck is excellent for predicting little things and bringing out the hidden magick that we often miss in our fast paced lives. The art is very comic book based but I’m a big fan of comic art so that’s another reason it appeals to me. I may use this deck for the forecast next week. What do you think? This entry was posted in Books, mysticism, occult, self help, spirituality, Tarot, Uncategorized, witchy, Writing and tagged astrology, card a day, divination, inspirational, magickal, motivational, numerology, occult, pagan, self empowerment, self help, tarot, wiccan, witchy. Bookmark the permalink.